Robin got home around 2:40, we finished the movie we started the day before, "There Will Be Blood" was really bad even though I hear it won awards. After the movie we napped, then Robin and I ran off to hear a friend of mine who was speaking. After that we picked up Brandon at home and the three of us when to Sonic to try a Sonic milk shake, Robin heard that they make the best. The wait was long but it was well worth it. The shakes were great. We sat outside and listened to "Sonic Radio" and enjoyed our drinks before heading home for the night. This is not the best photo, I know, but I am ready for bed so this is it for the daily photo. p.s. I also thought "There will be blood" sucked. Great shot. Very nice job! I like this shot! I love neon signs!!! We did not like "There Will Be Blood" either. Just wanted you to know!!! Also...we, too, can always enjoy a little afternoon nap...it's good for your health! 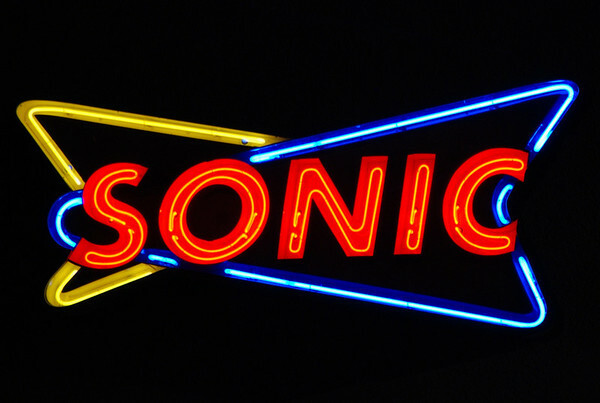 Now I want a Sonic burger! Neat shot!